But it really doesn't sound like Jaci Burton at all. The dialog is fake and overuses the characters names to the point where it's distracting, and it's completely lacking the usual emotion and body language usually conveyed in her books. I am having a really hard time with this book. I love the characters of Hope! 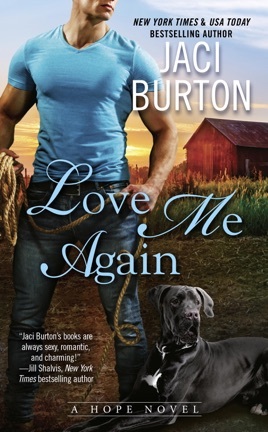 This second chance romance is terrific! Loretta finds her strengh divorces her husband, moves back to Hope and is raising her daughter on her own terms. Deacon was hurt by Loretta when she broke up with him after their high school graduation in spite of that, he is there to help, support and encourage Loretta. They are wary at first but, still have a connection after all these years later. It is a beautiful relationship that now includes a little girl. I highly recommend this book as well as the other books in the Hope series!